RishikaXCult: Official Word from Jagadguru Kripalu Parishat is that PrakashanandSaraswati has "Left the Earth Planet"
Official Word from Jagadguru Kripalu Parishat is that PrakashanandSaraswati has "Left the Earth Planet"
Jagadguru Kripalu Parishat helped this man escape justice. Someone passed on this information to me today. One of Kripalu Maharaj's preachers was giving lectures in Dallas, Texas, recently. An elderly couple walked up to him afterwards and asked him: "What is going on at Barsnaa Dham? Where is Prakashanand Saraswati?" He looked at them with a straight face and stated: "He's left the earth planet." What lies won't they tell? First of all, if he were dead, they would produce legal documentation so that the law would not keep hunting him down. He is, after all, still a fugitive from justice. Secondly, the official word from the U.S.A. ashram, confirmed by several sources, is that he slipped out of Mexico with a disguise and fake passport. Now he presumed to be hiding in India or Nepal. And according to my sources he is "well protected." Third, where is his long-time companion, Vishwambari Devi, who is also missing? Did she "die" too? Or is she hiding out with him in some remote village on the other side of the world? 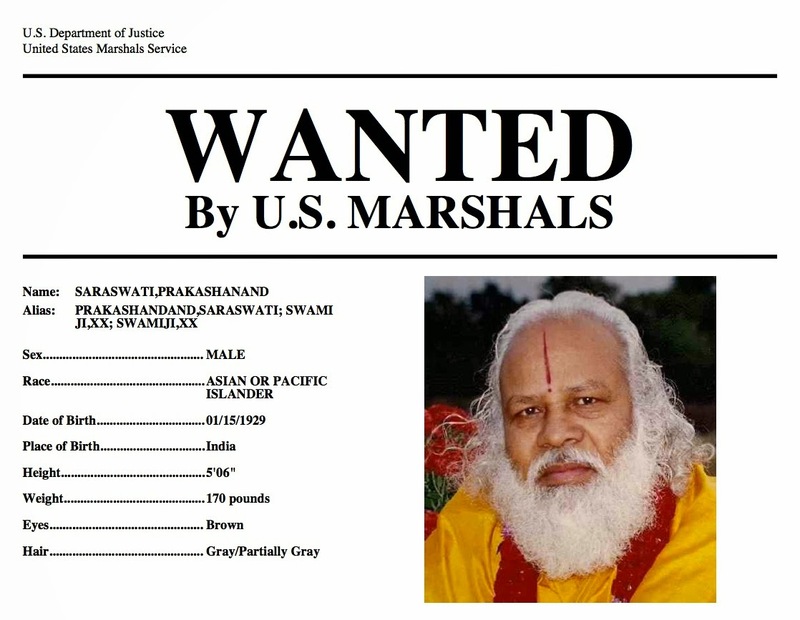 Jagadguru Kripalu Parishat is an organization that will help a convicted felon get away, hide him, and then lie about it. The next best question to ask is: who exactly helped him escape, starting the day he left Hays County, Texas? Really, spiritual place, isn't it? Very good points Ramanathanji. I also wish there were laws against these gangster gurus. They are a black mark on humanity. They are nothing but gypsy con men and women. There must be a law in india and elsewhere to stop Spiritual Gurus from building their empire. You haven't met to him,that is the reason why you are talking like this. You just want to prove right as wrong.You just want to prove light as darkness. If you think you are right,go & challenge him in spiritual knowledge. Jagadguru Kripalu ji Maharaj's teaching showed me the light & helped me to come out from the dark of the world.He is not a common men without meeting me he helped me & all my life is all for him & will be forever for him. I am so sad for you that you have given your life to such a con man. He gives nothing. He only takes. I do know him all too well - unfortunately. I feel sorry for anyone who falls for his scam. If you really want to know the truth, read my book. Otherwise, you are just in the dark. Its seems a joke when you say "challenge him in spiritual knowledge", even your Guru cant challenge a Doctor on his knowledge on medicine, that is why for every short of treatment he visiting doctor and living on pacemaker. Everybody is good in his own way, in his own knowledge, the Guru is good in philosophy, A Doctor is good in Medicine and I am good in my area...no body can challenge other in the knowledge the other is having and I am lacking, that of course does really not mean a person is saint because he has read lot of philosophy. After the incident in Austin, Texas have anybody has seen Prakashnand coming in any TV channel ?? He is alive now and why he hiding himself rather proving himself right ?? Nobody can deny that a Doctor saves life, helping to some person, does never implies he cant sexually exploit to another. If a Doctor start doing at work place then he would be in jail, even he knows that, so nobody is a fool to do any wrong activity publicly. Name & Fame comes how nice you show to people not from how nice you really are..
Lastly I am pity for all who dont want to see the fact. All are popular news channels can make some news spiced but cant show a false news without any truth behind it.